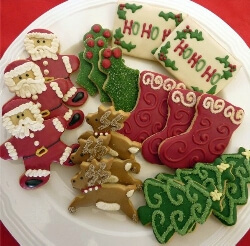 Christmas cookies are cookies cut and decorated into an assortment of shapes traditionally associated with Christmas like candy canes, snowmen, holly leaves, Christmas trees, Santa Claus, reindeer, Christmas presents, snow flakes and Christmas stars. Of course, a cookie, by definition, can be any of a variety of hand-sized, flour-based thin, sweet cakes, whether crisp or soft. In fact, the word “cookie” is derived from the Dutch “koekje” which means “small or little cake.” Cookies are usually baked until crisp or just long enough that they remain soft. They are made in various styles using an array of ingredients including sugars, chocolate, butter, spices, nuts, peanut butter or dried fruits. According to some accounts, cookies may have originated in Persia (now Iran and Iraq) during the 7th century, where sugar first came to be commonly used. From there, the art of baking cookies spread to Europe after Spain was conquered by the Muslims. By the 14th century, cookies were already fairly common in all levels of society throughout Europe. Cookies came to America in the 17th century along with the first English settlements. Among the popular early American cookies were the macaroon, gingerbread, and jumbles of various types. These cookie varieties are still classic favorites to this day. Bar cookies, which consist of batter or other ingredients that are poured or pressed into a pan, sometimes in multiple layers, and cut into cookie-sized pieces after baking like brownies, fruit squares, and date squares. 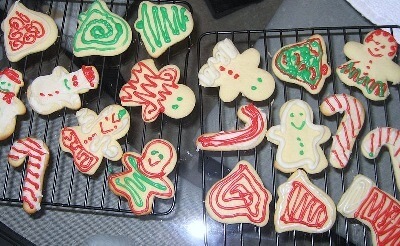 Drop cookies, which are made from soft dough that is dropped by spoonfuls onto the baking sheet. During baking, the mounds of dough spread and flatten. Examples are chocolate cookies, oatmeal cookies and rock cakes. Filled cookies, which are made from a rolled cookie dough filled with a fruit or confectionery filling before baking, like Hamantash. Molded cookies, which are also made from a stiffer dough that is molded into balls or cookie shapes by hand before baking, like Snickerdoodles and peanut butter cookies. No-bake cookies, which are made by mixing a filler, such as cereal or nuts, into a melted confectionery binder, shaping into cookies or bars, and allowing to cool or harden, like oatmeal clusters and rum balls. 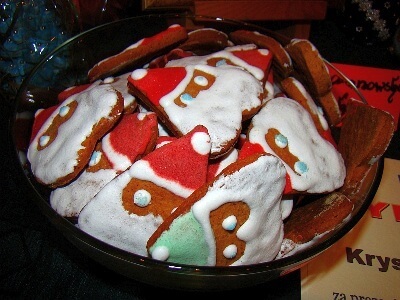 Pressed cookies, which are made from a soft dough that is extruded from a cookie press into various decorative shapes before baking, such as Spritzgeback. 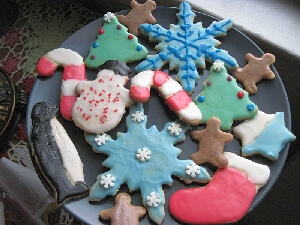 Refrigerator or icebox cookies, which are made from a stiff dough that is refrigerated to become even stiffer. Rolled cookies, which are made from a stiffer dough that is rolled out and cut into shapes with a cookie cutter like gingerbread men. Sandwich cookies, which are rolled or pressed cookies that are assembled as a sandwich with a sweet filling like marshmallow, jam, and icing. Whatever the type, whether store-bought or home-made, liven up your Christmas table by decorating your cookies with icing and toppings to match the theme of your Yuletide celebrations.